Back in my adventuring heyday, I was heavily involved in music, and I was really into the Los Angeles music scene at the time. This was back when Maroon 5 would be able to play a venue on Long Island, and walk around busy towns, virtually unnoticed. Yeah, that used to happen, even after Songs About Jane had been released by Octone Records. Wow, I feel really old right now. I would often make trips out to California, to visit my friend Melissa. We would always hit up a handful of shows while I was out there, and even a few band practices. There were even a few bands that I would sell merch for when they were in the New York area. One of those bands, Everybody Else, is today's featured artist. 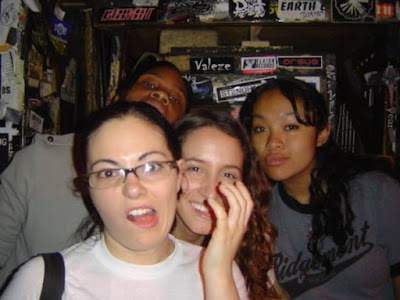 In 2002, their former bassist messaged me on Friendster (yes, Friendster - the grandfather of social networking sites), to tell me about the band they had just formed. Long story short, I fell in love with the EP. Ten years later, I am still listening to the band. Here is the video for First Class, which is off the album, Wanderlust, which was released in 2011. If you like what you saw/heard, check them out on iTunes (my favorite songs are Always, Faker, Makeup, Soldier Without an Army and Without You. If you prefer a hard-copy of your music (which I do), you can purchase all of their albums and some custom merch here. Most of the artwork you'll see is made by their talented singer/guitarist, Carrick Moore Gerety. Support independent artists! 2004: Being silly + selling merch for Everybody Else at CBGB.